Aerial view of Logan Circle by Ted Eytan licensed under Creative Commons. Population density is an important measurement of how built up urban areas are, but like all averages, it has its drawbacks. To better describe how people live in urban areas, I looked at an alternative measurement called Population Weighted Density. Here’s what it means for the Washington region. A typical population density measurement is simply the number of people in an area, divided by the size of the area. Metropolitan areas cover large amounts of land, ranging from very dense to very rural population tracts. The Washington, DC Metropolitan Statistical Area is nearly 5,600 square miles, meaning the population density for the area in the 2010 Census data is less than 1,000 people per square mile (ppsm) — a figure less than what we normally associate with urbanized areas. Areas with 1,000 people per square mile or less also do not describe the greater Washington metropolitan area well, since only around 16% of the population lives in these areas. What is Population Weighted Density? Population Weighted Density attempts to better describe metropolitan areas by parsing out the average densities of the separate census tracts cities are composed of. A number of urbanists have already looked at cities with this measurement. To find this meaurement, you multiply the population density by the total population of each census tract in a metropolitan area, add them all together, and divide the lump sum by the metropolitan population. The resulting number approximates the average density of neighborhood where residents live. In the case of the Washington Metropolitan Area, the Population Weighted Density equaled 6,388 people per square mile in 2010. What exactly does this mean? As GGWash Contributor John Ricco showed, examples of Washington neighborhoods in the 5,000-6,000 ppsm range include the Palisades or Brookland. Although Ricco looked at a sizes larger than Census tracts, these neighborhoods primarily consist of single family houses. Interestingly enough, 6,388 ppsm is just a bit lower than the standard density of 6,749 ppsm for the area within the Beltway. If 6,388 is what a typical census tract in the Washington region might look like, what about other cities? Among the 10 largest metropolitan areas nationally, Population Weighted Density varies enormously. New York is by far the densest metropolitan area in the country, with 31,251 ppsm. Despite its reputation for sprawl, Los Angeles is the second densest metropolitan area. Nonetheless, Los Angeles trails far behind New York’s density at 12,114 ppsm. On the other end of the spectrum, Atlanta has 2,173 ppsm. Texas’s large cities fall about halfway in between them and Washington, DC, with around 4,000 ppsm. Because of the wide range of weighted densities throughout American metropolitan areas, I decided to focus on Washington’s closest peers. I removed New York from the graph, since it is such an outlier among American cities, as well as most ‘typical’ metropolitan areas, which fall below 4,500 ppsm (to see more about these areas, the Austin Contrarian has a good comprehensive list of Population Weighted Density for other metropolitan areas). Among other larger metropolitan areas, Washington is among the denser areas, but it falls behind Northeastern cities like Philadelphia and Boston, California’s largest cities, and even some Sunbelt cities, like Miami and Las Vegas. Neighboring Baltimore has a slightly lower density at 5,435 ppsm. Henderson, NV in the Las Vegas metropolitan area. Despite its largely suburban character, Las Vegas has a slightly higher population weighted density than Washington, DC. Henderson, Nevada by Ken Lund licensed under Creative Commons. 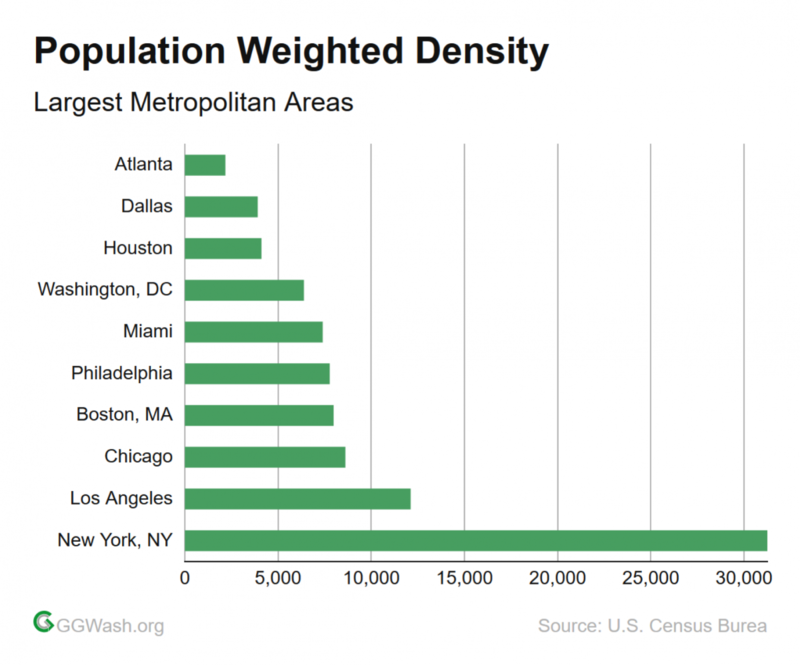 As economist Paul Krugman points out, at 5,369 ppsm, the Population Weighted Density for the entire United States is pretty similar to the Baltimore metropolitan area’s weighted density. So, in other words, greater Baltimore is a rough snapshot of the area where the average American lives in terms of density. The Washington region, in turn, is 19% denser than the American average, by this metric. 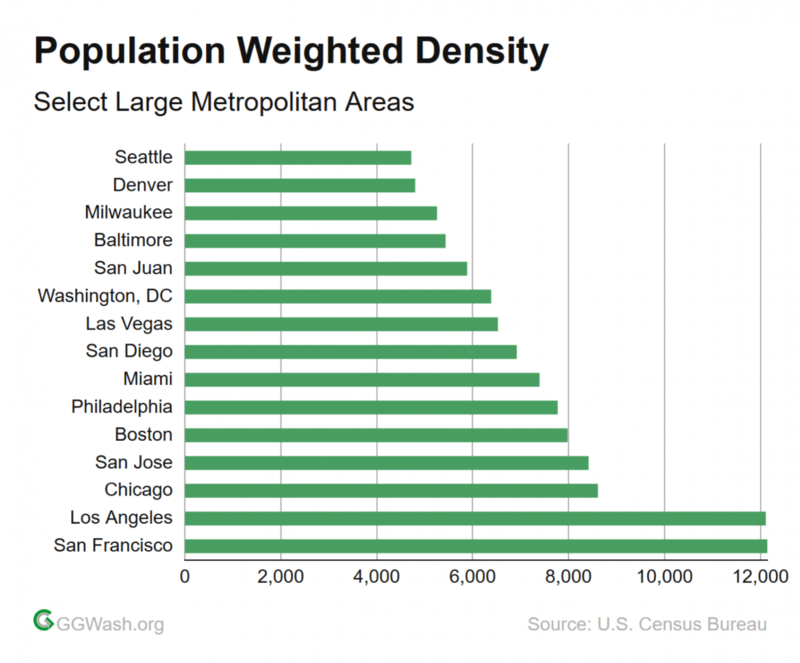 Using a Population Weighted Density measurement, the Washington region has an above average density, but a number of metropolitan areas are still significantly denser. Contrary to the idea that our region is becoming overcrowded, this measurement shows that we have less people in the typical populated area than our peers in the Northeast, California, or even parts of the Sunbelt. Why does this matter? Higher density can have a number of benefits, including higher economic productivity and environmental sustainability. What do you think of Population Weighted Density?